Today, “Black Friday,” Dark Regions Press has announced its own post-Thanksgiving sale, this one lasting through Sunday, December 1. Two offers may be of interest for those who don’t yet have my first two mostly-prose collections, STRANGE MISTRESSES: TALES OF WONDER AND ROMANCE and DARKER LOVES: TALES OF MYSTERY AND REGRET, but might be tempted to get one or both at a bargain price. Any one paperback is being offered for only $9.00, the buyer’s choice, which amounts to a savings for DARKER LOVES, although the older and lower-priced STRANGE MISTRESSES might cost less at what seems to be a continuing offer (that is, regardless of this special sale) of 50 percent off of all backstock titles. 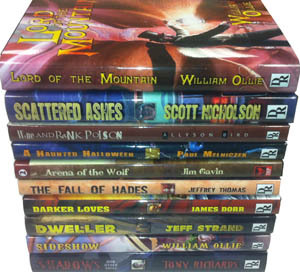 Then, for the second, Dark Regions is also offering one limited edition, hardcover, deluxe copy of ten pictured titles for just $25, which includes the deluxe edition of DARKER LOVES, although this appears to be more like a grab bag rather than letting you choose your title. There are other offers in this sale too, though, some involving multiple titles, with information on all of these available by pressing here. In other dark news, the premiere issue of BLOODBOND (see May 16) arrived today and the opening item in this first issue is a poem by me! 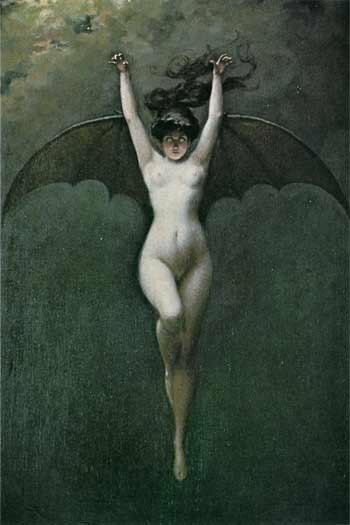 Published by Alban Lake Publishing, BLOODBOND is a semi-annual print “digest of Vampires, Werewolves, and Shapeshifters” with the current November issue edited by Terrie Leigh Relf. And so, along those lines, my poem is “In the Company of Wolves” about what happens in present-day America when werewolves grow up. Other authors and poets in this issue include Sandy DeLuca, John Grey, Tyree Campbell, and Marge Simon. For more information, guidelines, and ordering information on BLOODBOND and its sister publications, including DISTURBED (see June 20, et al. ), check out the Alban Lake website by clicking here. Also, just following “In the Company of Wolves” is a two-page spread on my poetry book VAMPS (A RETROSPECTIVE), for more information on which click its picture in the center column. “Our Black Friday sale begins… NOW! “Buy any PAPERBACK on our library page, and receive a free 1 year subscription to our One-Night Stands stories! That’s a short story every month for one year (value: $10). For more, go to Perpetual Publishing’s site by pressing here. And that was quick. Word came this afternoon that MISERIA’S CHORALE is in fact out today, both in electronic and print editions, with illustrations and weighing in at more than 400 pages! To see for yourself, on Createspace press here; on Amazon here for the print edition and here for Kindle. 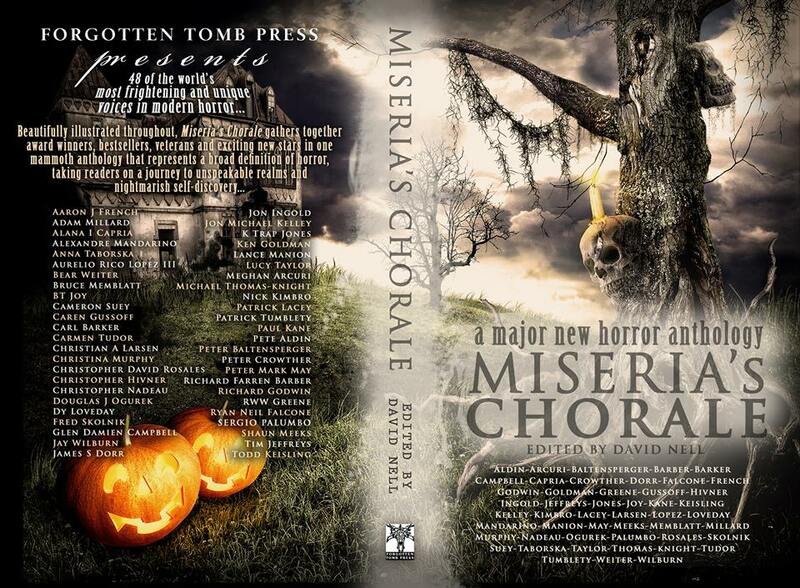 “MISERIA’S CHORALE, edited by David Nell, is nearly complete, and so is the cover art — front and back,” came the announcement today via Facebook. It went on to say, “Nell has included a diversity of voices in the upcoming Forgotten Tomb Press title, boasting authors from countries such as the United States, Canada, Brazil, Great Britain, Italy, South Africa, the Philippines, and Australia.” My story in this one is “The Cherry Tree” (cf. November 8, et al. ), a ghost story with roots in the Civil War but with tendrils that reach into present day Vicksburg. At last word, MISERIA’S CHORALE was supposed to be out by the end of this month and whether this indicates a delay or not, it still seems to be on track for a release in time for Christmas. And, glancing at the table of contents (a possibly not-yet-complete listing is posted below for October 14), it looks to be an anthology worth waiting a few days — or few weeks — more for. And in the meantime, to whet appetites, the Facebook announcement also includes the current cover art, front and back, for which see right here. Also Untreed Reads Publishing announced today that they’ve opened a special page for people looking for winter holiday books, including titles for Thanksgiving, Hanukkah, Christmas and New Year’s. I have two hounds in this hunt myself, the Christmas short story chapbook I’M DREAMING OF A. . . . and the lead story, “Appointment in Time,” in the Untreed Reads New Year’s anthology YEAR’S END: FOURTEEN TALES OF HOLIDAY HORROR. Those interested can check out these and other titles by pressing here, or to go directly to I’M DREAMING OF A. . . . by clicking on its picture in the center column. An extremely comprehensive review by Heather Landry of BLEED (see September 6, August 27, et al.) is currently up on THE HORROR ZINE. This is Editor Lori Michelle’s 45-author anthology of short fiction, essays, and poetry with profits dedicated to the National Children’s Cancer Society, released at the end of this summer by Perpetual Motion Machine Publishing. And (may I brag? ), the reviewer says of my offering, originally published in GOTHIC.NET in March 2002 and also reprinted in my 2007 Dark Regions collection DARKER LOVES: TALES OF MYSTERY AND REGRET, “. . . and I consider ‘King Rat’ to be another one of this book’s little masterpieces.” To see for yourself, check out THE HORROR ZINE’s review by pressing here, or, better yet, for the publisher’s site to order the book — available now in both print and electronic formats — press here. In other news to round out the weekend, the contract for “Casket Girls” (see November 19, below) arrived this morning from DAILY SCIENCE FICTION. Blurb copy and bio are also requested which may keep me up for a bit tonight, but it’s all worth the effort. Part of “the writing life,” one might call it. More to the point, things are moving along and, while past experience with DAILY SF has involved a three to four month period between acceptance and publication, wouldn’t it be neat if this one came out by the end of the year? Already available electronically the week before Halloween, SPLATTERLANDS (see November 13, October 22, et al.) is now being offered in print form as well. “SPLATTERLANDS reawakens and reimagines the hyperintensive writing style and controversial themes indicative of the original Splatterpunk movement,” to quote their ad copy. “Containing the work of some of the freshest voices of our modern time, it is an anthology of deeply intelligent short stories whose extreme themes and graphic depictions of violence and terror are intended to have a lasting effect for years to come.” My own piece in this is an original blue-collar noir story titled “The Artist,” while other contributors include Michael Laimo, Gregory Norris, Jack Maddox, Ray Garton, A.A. Garrison, Michele Garber, Paul Collrin, Chad Stroup, Allen Griffin, Christine Morgan, J Michael Major, Eric Del Carlo and Luke Spooner. To check SPLATTERLANDS out on Amazon in its paperback newness press here. Or if one is feeling lucky, publisher Grey Matter Press also reminds us they’re running a giveaway on Goodreads for three more weeks, until December’s Friday the 13th, for more on which click here. Today the word came from Editors Jonathan and Michele of DAILY SCIENCE FICTION (see, e.g., May 5 2012; December 28, 21 2011, et al. ): the peripatetic Casket Girls have found a new home. “A sample email, including any edits to your story that may be necessary, will come later.” This will be the third story I’ll have had published in DAILY SF, one of the top markets for speculative flash and near-flash fiction, the previous two being “Naughty or Nice” and “Killer Pot” (the latter of which followers may recall was linked to on October 31, below, as a lagniappe for this year’s Halloween). As for this one, more news will appear here as soon it comes to me. 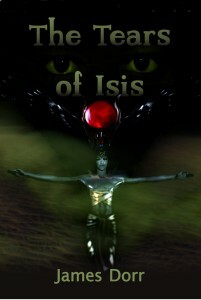 A new review of THE TEARS OF ISIS went up on Amazon today, having already appeared on Goodreads Sunday. And this one, from Australian author Natasha Ewendt, gives the collection five stars out of five, not to mention some very alluring words! “Is there anything better than a short story collection that pulls you in from the very first line?” “Each tale has a killer twist, deep dark intrigue and/or something disturbing to make you shiver.” To read for yourself on Amazon press here (in the interest of full disclosure, not all of the reviews are as good, alas, but one must make up one’s own mind about them — and, in fact, seeing all together I think gives a better idea of a book as a whole in terms of why one reader may like one aspect that a second reader may be less excited by), on Goodreads here. And for both a thank you from me to Natasha! In more mundane matters, today I also sent back the proof sheets to Editor Alex Hurst for GROWING CONCERNS (see November 4), Chupa Cabra House’s upcoming Ecological Horror anthology. My offering in this is “Seeds,” the tale of an uppity flower garden in the Chicago area and why one’s Sunday afternoons might be more safely spent watching baseball on TV. Another story was published today, although only a little one. MISCELLANEA: A TRANSCENDENTAL LIBRARY has posted one of my shorter tales, “As Fine as Frogs’ Hair” (see September 16; for an earlier entry in the “library” see also April 5 2012, et al. ), a take on Rapunzel and other Fae folk — or is it? And all in only 75 words. “Miscellanea: the Transdimensional Library collects and provides access to books, periodicals, multi- and other-media materials from over a thousand different planes of existence,” so the site says. “Members can access materials with their library card (subject to cellular compatibility with host planes and provided that there is no danger of paradox, violations of the space and time continuum, or library fines).” Though the careful will note that doesn’t prevent the occasional card catalog misspelling of an author’s last name. Be that as it may, you can see for yourself at publisher Eggplant Literary Productions, Inc.’s website by clicking here. Just look for the file card and press it too and, MISCELLANEA being a free library, read the story as well at no cost — which even for less than 100 words still counts as a bargain. Twelve days into this November’s Poem-A-Day poem-athon (or whatever one calls it, cf. November 1), I’ve made my first sale of one of the results. This was the one based on the Day 3 prompt for a “The last time I was here” poem — to imagine one “returning to a spot (physical, emotional, psychological, etc. ).” So I wrote a shadorma and a few days later sent it to STAR*LINE, from whence it returned with a note to the effect that Editor F. J. Bergmann liked the sentiment but not the form, inviting me to rewrite and re-send it. So I cast it in a more minimalist style, reducing it from six lines to four, and sent it back a few more days later. And yesterday evening it was accepted, nine days after its initial writing! So look for “You Never Can Go Back,” about changes for the worse in the new Transylvania for those who remember its good old days, in a future issue of STAR*LINE. Or the moral: See? There’s a point to the month-of-poems madness, that some will be saleable, and even for those that aren’t the practice is worth while. On a prosier note, Grey Matter Press has announced today that it is giving away ten copies of the print edition of SPLATTERLANDS: REAWAKENING THE SPLATTERPUNK REVOLUTION (cf. October 22, et al.) on Goodreads between November 13 and December 13 2013. Needless to say, I have my own offering in this, as the publisher puts it, “collection of extreme horror with a point that is SPLATTERLANDS,” a blue collar noir tale of aesthetics and love called “The Artist.” For more information or to enter the drawing readers can press here.